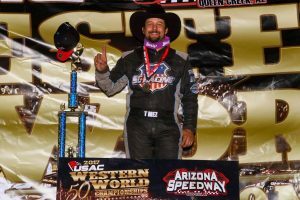 San Tan Valley, Arizona………Thomas Meseraull has proven time and time again that, regardless of the situation he’s faced with, he figures out the way to get to victory lane. Winning for a team he’s never driven for? Check. Taking an admitted “fourth-place car” to first in the final laps? Check. Having your initial instinct take a detour, yet still managing to find the quickest way around? Checkmate. On night one of the 50th Annual Torco Racing Fuels “Western World Championships” at Arizona Speedway, chaos created opportunity for Meseraull. A wild sequence of events put forth in motion an unlikely scenario that pitted a driver who, as of a week and a half ago, was without a ride and had no plans on racing in the “Western World” versus a driver who flipped his car on the tenth lap of the feature. After five consecutive laps of Bacon snuggling the bottom line and Meseraull rim-riding the top shelf, Meseraull prevailed on the final lap to win his third USAC AMSOIL National Sprint Car feature of the year. For his third different team. For two-thirds of the 30-lap feature, the race appeared to be owned by Courtney, who ripped around the outside of Thomas coming off turn four on the second circuit to grab the lead. Courtney instantly opened a gap over Thomas of 1.5 seconds before being encumbered by the tail end of lap traffic on the eighth trip around the one-third-mile. Thomas was able to poke a nose under Courtney at the flag stand on lap nine and appeared poised to set up a turn one slider for the lead, but traffic stood in the way, thus negating any notion he may have had for the time being. An instant later, Courtney biked on the top, but maintained control and carried on without issue. Just behind, seventh-running Brady Bacon ran into trouble in nearly the same spot that Courtney biked. Seemingly, the incidents fell in Courtney’s favor as he saw his lead dwindle when meeting up with lapped traffic on lap 17 when Isaac Chapple sailed over the turn two guardrail without getting upside, landing on his wheels in the area between the backside of the barrier and the billboards. On lap 23, Courtney caught another break when Chet Williams barrel-rolled hard through turn one in an accident that also involved C.J. Leary. All involved were okay. On the ensuing restart, barring another caution, Thomas encountered what may have been his last chance at to make a run at Courtney for the lead. As Thomas slid to the inside of Courtney, the battleground for track position was not fit for two occupants. Exiting the second turn, the two made contact, but both got back up to speed to remain in the tussle. Courtney, now trailing slightly, attempted to slide Thomas right back between turns three and four. The two banged wheels again. Thomas would get the worst end of the equation initially when he kissed the rail with his right-side tires before getting back on track, though now mired all the way back in ninth. While chaos ensued between positions one through six, Bacon tip-toed on the bottom from seventh to the lead and built up a half-straightaway lead before 2017 USAC West Coast Sprint Car champ Jake Swanson spun at the exit of turn four with five laps remaining to bring out the final yellow of the evening. Though Meseraull was sitting in third, he had a pair of war-wounded racecars running first and second just ahead of him with Bacon’s car suffering from a bent Jacob’s ladder and a cracked brake fitting while Courtney’s mount had a left front tire giving out on him. When it was time for the San Jose, California native to strike, Meseraull altered his plan of attack on the fly, putting him in the spot that fits him to a T.
From that point forward, it was a tale of a two strategies with Bacon on the bottom and Meseraull topside. Meseraull managed to nose ahead on lap 27, but on laps 28 and 29, Bacon found a surge off the bottom to propel himself to satisfaction by a single car-length at the line. Though Meseraull still trailed Bacon, albeit by a miniscule margin, he found something that turned out to be a path paved to victory. Meseraull emerged with the lead coming off turn two on the final trip around the oval and, though, Bacon made one last ditch effort at Meseraull off four, it was to no avail as Meseraull secured the win by 0.334 seconds over Bacon, Robert Ballou, new series point leader Chris Windom and Courtney rounding out the top-five. Broken Arrow, Oklahoma’s Brady Bacon nearly pulled off an improbable victory that would’ve resulted in one of the most unique box score stats ever recorded by returning to win after flipping during the very same feature. However, it was not to be as the two-time USAC AMSOIL National Sprint Car champ completed an overall successful night when it comes right down to it, finishing second in his Dooling-Hayward/B & H Contractors – Dooling Machine/Spike/Stanton Mopar after earlier capturing the victory in the USAC Southwest Sprint Car feature. Robert Ballou’s first ever visit to Arizona Speedway was a roller coaster ride. After qualifying 20th and starting 18th in the feature, the Rocklin, California native overcame all obstacles to race to third, thus earning KSE Racing Products, Saldana Racing Products/Rod End Supply Hard Charger honors for the night. Contingency award winners Friday night at Arizona Speedway included Damion Gardner (ProSource/Woodland Auto Display Fast Qualifier), Kevin Thomas, Jr. (Simpson Race Products/Extreme Mufflers 1st Heat Winner), Brady Bacon (Competition Suspension, Inc./Brown & Miller Racing Solutions 2nd Heat Winner), Isaac Chapple (Chalk Stix/Circle Track Performance 3rd Heat Winner), Robert Ballou (Indy Race Parts/Keizer Aluminum Wheels 4th Heat Winner & KSE Racing Products/Saldana Racing Products/Rod End Supply Hard Charger) and Josh Hodges (Wilwood Brakes 13th Place Finisher). PROSOURCE/WOODLAND AUTO DISPLAY QUALIFYING: 1. Damion Gardner, 4, Alexander-14.892; 2. Brady Bacon, 63, Dooling/Hayward-14.998; 3. C.J. Leary, 30, Leary-15.034; 4. Tyler Courtney, 23c, TOPP-15.230; 5. Chase Stockon, 32, 32 TBI-15.338; 6. Thomas Meseraull, 19AZ, Reinbold/Underwood-15.373; 7. Justin Grant, 11, McGhee-15.405; 8. Charles Davis, Jr., 50, Massey-15.493; 9. Kevin Thomas, Jr., 9K, KT-15.515; 10. Landon Cling, 34, Cling-15.521; 11. Stevie Sussex, 42, Cheney-15.523; 12. Brody Roa, 91R, BR-15.640; 13. Jake Swanson, 92, Sertich-15.646; 14. Mike Martin, 16, Martin-15.655; 15. R.J. Johnson, 51, Martin-15.723; 16. Chad Boespflug, 69, Dynamics-15.788; 17. Danny Faria, Jr., 17GP, Dutcher-15.836; 18. Chris Windom, 5, Baldwin-15.855; 19. Isaac Chapple, 52, LNR/Chapple-15.885; 20. Robert Ballou, 12, Ballou-15.917; 21. Dave Darland, 73, Ford-16.021; 22. Hunter Schuerenberg, 19s, Reinbold/Underwood-16.036; 23. Mike Spencer, 4s, Gansen-16.064; 24. Austin Williams, 2, Jory-16.074; 25. Cody Williams, 44, Jory-16.148; 26. Chet Williams, 38, Williams-16.294; 27. Logan Williams, 5J, Jory-16.295; 28. Matt McCarthy, 28m, McCarthy-16.295; 29. Chris Gansen, 4G, Gansen-16.449; 30. Jeremy Ellertson, 98, Ellertson-16.521; 31. Josh Hodges, 74x, Hodges-NT. **Bacon flipped on lap 10 of the feature. Ch. Williams flips on lap 23 of the feature. FEATURE LAP LEADERS: Lap 1 Thomas, Laps 2-22 Courtney, Laps 23-26 Bacon, Lap 27 Meseraull, Laps 28-29 Bacon, Lap 30 Meseraull. NEW USAC AMSOIL SPRINT CAR NATIONAL CHAMPIONSHIP POINTS: 1-Windom-2045, 2-Grant-2038, 3-Thomas-1954; 4-Courtney-1930, 5-Stockon-1795, 6-Boespflug-1782, 7-Leary-1704; 8-Bacon-1619, 9-Ballou-1573, 10-Darland-1410. NEW USAC AMSOIL CRA SPRINT CAR POINTS: 1-Gardner-1358, 2-Swanson-1223, 3-Roa-1213, 4-Spencer-1050, 5-A. Williams-931, 6-Co. Williams-839, 7-L. Williams-745, 8-Max Adams-702, 9-Gansen-700, 10-McCarthy-608.